The Australian Youth Dance Festival (AYDF) is back in 2017, and for the first time ever, the Festival will be held in a major city – Melbourne! Under the artistic direction of Adam Wheeler, AYDF2017 will be remodelled into three days of intensive masterclasses with some of Australia’s leading dance artists, choreographers and companies, and will premiere excerpts from at least six new works from leading youth dance companies across the country. 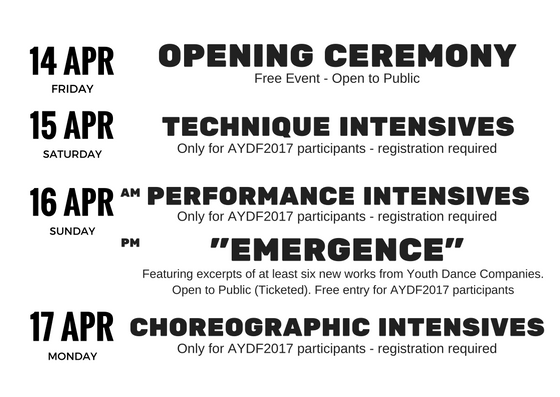 The Australian Youth Dance Festival (AYDF) is the nation’s first dance-specific festival for youth. In 1996, Ausdance National identified a major gap in the networking of youth dance practitioners and young artists. Many young people were already expressing themselves through dance in unique and creative ways. However, in a country this size, there was virtually no contact with their peers with similar interests in other cities and towns. By initiating a youth dance festival, Ausdance also hoped to address some of the social issues faced by young people isolated by distance, population, regional and racial tensions. Creative art is a common support and channel of expression for young people; dance being one of the mediums. Through AYDF, we aim to provide young people a forum for healthy exchange and to begin their professional development. Next Post Cirque du Soleil in Melb | Win TIX!